As observed in Custom/Manual Setup with Version 1.0 board and Version 2.2 drivers from PNPV22B.ZIP. Found a Plug And Play BIOS. Found 2621440 bytes of DRAM. Found ROM chip: 1 AMDGM_1_1_. The values in ULTRASND are Baseport,Play DMA,Record DMA,UltraSound IRQ,SBIRQ. 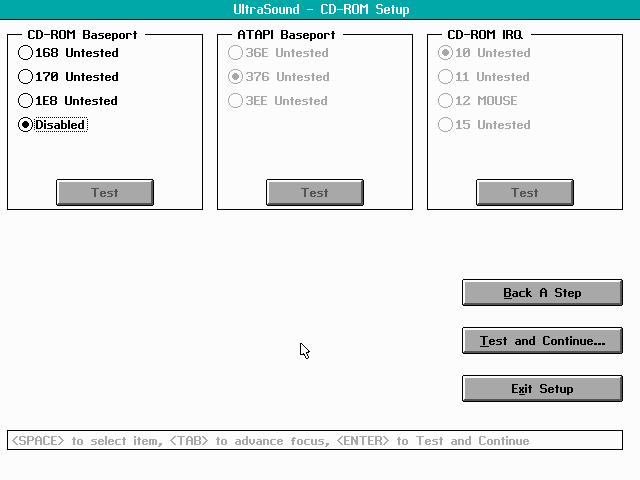 BLASTER specifies Sound Blaster 2.0 emulation using IRQ 5 (SBIRQ) and DMA 1 (not changeable). Unfortunately, somewhere in the process the two DMAs get reversed and ULTRASND winds up being wrong! There is obviously a problem somewhere since the output is the reverse of what comes from GUS Classic setup (version 4.11 drivers) after the same playback and record DMAs are chosen. With the anonymous identifiers DMA1 and DMA2, it's impossible to say which is which, but for ground truth, Mpxplay version 1.59b works with ULTRASND=220,7,5,7,5 (in agreement with the GUS Classic setup) but plays only silence with ULTRASND=220,5,7,7,5 (the result of the GUS PnP setup). DOOM and DUKE3D apparently don't use this variable and work either way. Once the Gravis software is installed and IW.INI has been created, IRQ and DMA reassignments can be made through manual edits to IW.INI and the environment variables. MPUIRQ appears to be for interrupt-driven I/O from an external MIDI device. 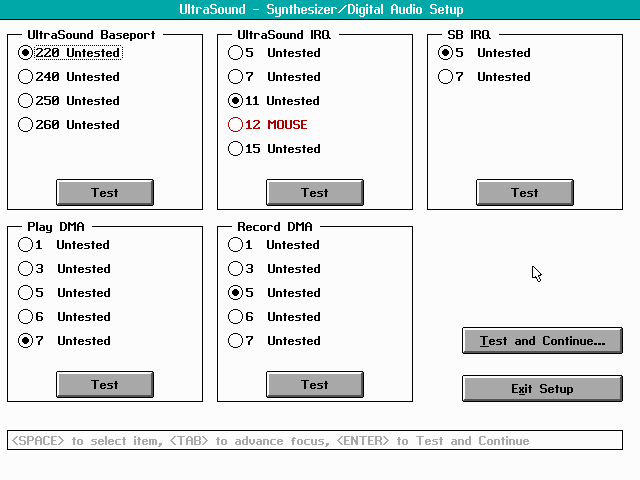 IRQ2 is for the GUS synth device, but its function is completely unclear. Manual setup doesn't even mention it but always sets it the same as IRQ1. There are several ways to reduce the number of IRQs and DMAs needed. As-is, manual setup in the GUS PnP setup program allows disabling the CD-ROM and game port and setting the play and record DMAs to the same value (forcing half-duplex operation), but nothing more drastic. Presumably, manually editing IW.INI to zero out other unwanted port and IRQ assignments has the intended effect. An unwanted CDDMA should be set to 4 rather than 0; DMA 0 is actually usable while DMA 4 is not. Additionally, there are three different tools for patching the PnP configuration information in the card's firmware to prevent resources from being allocated by PnP BIOS or "Automatic Setup:"
P20DISK3.ZIP, the official "UltraSound PnP 2.0 Preparation Disk," provides a choice of firmware patches. GRAVIS.ROM eliminates IRQ2, CDDMA, and MPUIRQ. 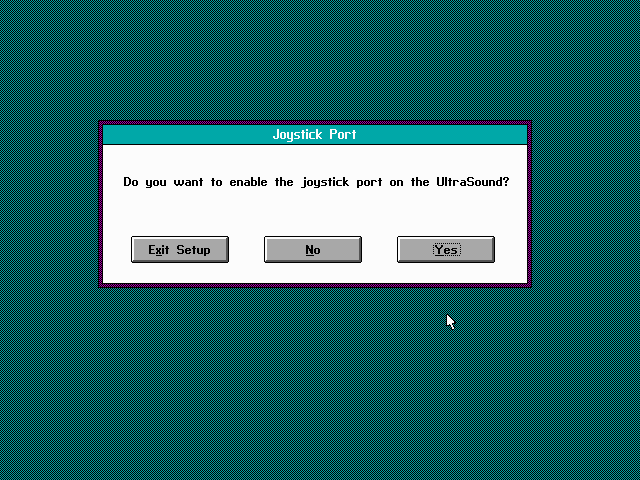 GRAVNOCD.ROM does that, but also deletes the CD-ROM device, expands the possible port ranges for the joystick and MPU-401, expands the list of possible SB IRQs, and designates IRQ 5 as the preferred SB IRQ. The patch is applicable to "the Advanced Gravis InterWave Board With B Step Silicon," whatever that means. I did not try this patch on my board, but it became moot since PNPCFG (see below) apparently installed the same patch without asking. The PNPV22B.ZIP drivers come with a program PNPCFG that purports to disable any unwanted devices, with the following caveat: "Any changes you make with this utility will not show up in the "Manual Setup" of the DOS/Windows 3.x Setup program. However if you use the "Automatic Setup" option any changes made with PnPCfg will take effect." 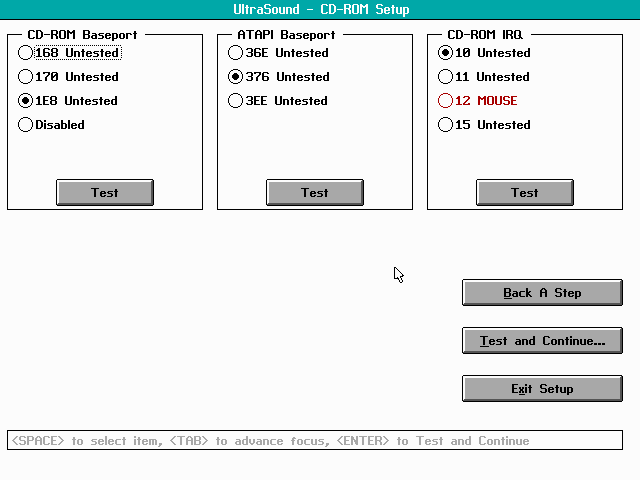 What it in fact does is update the entire firmware PnP table of the sound card, just like P20DISK3. I ran it once in an attempt to disable the CD-ROM device; what it did was install the GRAVIS.ROM patch minus the CD-ROM device. The result is not quite identical to GRAVNOCD.ROM since the joystick and MPU-401 port ranges and SB IRQs were not altered. IWEEPROM13.ZIP, the unofficial "XSS InterWave EEPROM Toolz," purport to provide complete manual control over all resources. The terse documentation doesn't say anything about different versions or steppings of the GUS PnP. I have not tested these at all. IWSBOS or MegaEm is required for Sound Blaster emulation.